Dear Ava, Copenhagen is an amazing city(1)! I miss you terribly! During the voyage my mind effortlessly wondered to you, my love! The uncertainty became like the changing waves with the only certainty in my thoughts being you. I did much thinking on the voyage. I have been less certain about our quest than in the weeks before I left Cape Town. I wondered if we are completely crazy! I would pace the deck and tell myself that the plan is simple and good. We want to cure bacon. I have been questioning everything and reflected on the road and influences that got us to this point. David Graaff had a huge impact on me. He may be short but has a “big” personality. (Simons 2000: 143) I was 6 when I met him at their butchers shop at the Shamble (4). and he must have been 16. I went with my dad for his weekly meat purchase as I continued to do every week after that. I liked Dave immediately, as much as my dad liked his uncle, Jacobus Combrinck, his boss at that point. It was Combrinck who taught David how to be a butcher (Simons 2000: 8 – 41) (2) and the fact that they could never get bacon curing right is our future. It was you and me who took him on a hike up Table Mountain when my dad suggested it. Since that first hike up Platteklig Gorge, we must have been up with him more times than with anybody else. It dawned on me during the voyage why he did it so often. We were kids, looking for pocket money. Taking foreigners and wealthy locals up on a mountain where there are no established footpaths, were fun to us. We did what we love and got money for it. For David it must have been a way to escape the squalor of the Shamble. The stench and disorderliness. Its difficult to imagine how things can get so out of hand and how the city’s slaughter area can become such a disgrace. They are making a small fortune at their number 4 shop, but the conditions are hideous. The sensation as you make your way up the mountain is something that is hard to explain to people who have not done it. It is as if you ascend to another plain. The air becomes fresh and sweet. Even gale force winds that sometimes blow invigorates the body and mind. The dramatic movement of the coulds. The exquisite plant life. The intoxication beautiful shape of the rocks. As you climb, you get distance between you and the world you live in and it is as if you soar above all difficulty and stress of every day life. You forget about everything except the splendour of the surroundings you find yourself in. If it was true for us as kids, growing up in Cape Town, how much more must this have been for David Graaff! I realised that everybody needs a Table Mountain to escape to. Who would have guessed the close friendships that developed. Remember our hikes up Kasteelpoort to the Valley of the Red Gods. David always went on about how he would build a reservoir for drinking water to Cape Town at the top of Kasteelpoort (Slingsby) one day. Now that he is major, I wonder if he will build it. (Simons 2000: 25, 26). (3) I really wish him the best! He is a remarkable man. Jacobus Combrinck has left the business to David’s running while he pursue public office at a time when David was barely 30! Jacobus Combrinck and my dad introduced us to David Graaff. His uncle introduced him to being a good butcher. We introduced him to Table Mountain. I hope we will now show him that its possible to make good bacon in Cape Town. The disappointment of Oscar and my first attempt to make bacon still haunts me. The pig we slaughtered on his farm was healthy. We cured it with the curing salt we bought in Johannesburg, the meat turned reddish/ pinkish, as it should. We smoked it. When we ate the meat two weeks later, it was off. Why? I know I have asked this question all the way from Potchefstroom, back to Cape Town on the train. Uncertainty entered my mind. Why not just leave curing bacon to the people from Calne in the UK with their extra smoked Wiltshire Cure? I am sure this is where David and Cornelius buy the bacon they import. Was my mom not right when she told us that Oscar and me are trying to be too clever again. I was glad when we arrived in Copenhagen. New places take my mind off nagging doubt. Denmark is much better than I expected. The people are as friendly as the people at home. I thought they would be off-ish, but they are not. Andreas met me at the harbour. He is a very intelligent guy. Friendly and he did not mind that I know nothing about curing bacon. When I put my bags down in my room, he immediately called me into the kitchen. He poured us two glasses of home brewed beer. He sat down and before I even had a sip of the beer, he bluntly asked me: “So, you want to do what with the pork meat?” This was the last time I doubted our quest. Since then everything has changed. I am eternally thankful to the old Danish spice trader in Johannesburg who gave Oscar and me his name and said that if we want to learn how the English cure bacon, that I must visit his friend in Copenhagen. Andreas is a young man and I am very much impressed with him. After we had his home made beer, Andreas showed me a textbook from the time when he did his apprenticeship at the pork abattoir in Copenhagen. Edward Smith from Great Britain wrote it in 1873 (Smith, Edwards. 1873). 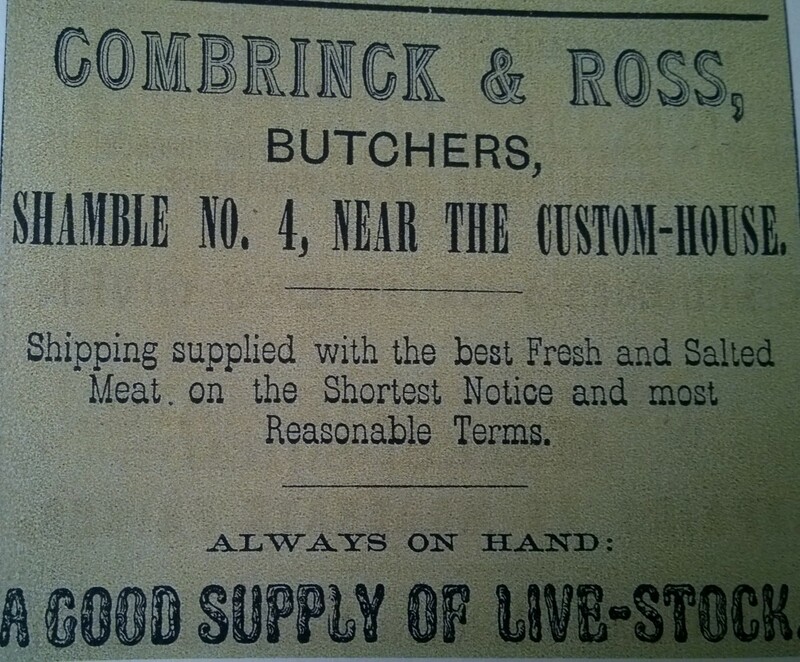 Three years after David joined Combrinck’s butchery. (2) He showed me the book but since it was Sunday we did not talk about bacon any more. Instead he took me on a tour of the city. It is smaller than I expected. Everybody knows everybody. The way they organise their meat districts are impressive. Sheep, cattle, pork and chicken are all handled in separate areas. The Shamble (4) in Cape Town is a disgrace. I am very happy that David is talking as much about cleaning this up as he is about electricity and water supply to the city. I hope he becomes major! (3, 4) My ancestors have much to teach us about decent living. Life is worth living well! This includes taking care where we live. Life must reflect what nature teach us. It must be simple, clean and orderly. For starters, they dont let chaos and filth prevail. They get architects to demarcate and design buildings for specific purposes. He took me to the Meat District of Kødbyen. Special pens have been build to hold the animals. Not like it Cape Town where the frightened animals often break out of poorly constructed camps and rampage through the streets (Simons 2000: 11). The next day was Monday and work started. We got up early and I went with Andreas to work. This has been the routine every day. In the afternoon we have the last meal at around 9:00 p.m. After supper, Andrea’s dad read for us (Borgen, Wilhelmine and David: 50). He reads from different books the kind of thing that men should know while his wife and Andreas’s sisters do their sowing and needle work. I feel it is to “humor me” that they are reading from Foods by Edward Smith, but I dont mind. It leads to the most fascinating discussions. I dont want to boar you with the details of what I am learning. I know you are very interested, but I dont want my letters to you to become lectures. I miss you too much and besides, I dont want to write Oscar about nice buildings and the how clean everything is. This is the kind of thing you and I have complained much about in Cape Town and I think you find it interesting. Likewise, the deboner is an artisan. He knows exactly how to remove the meat from the bones so that the meat are presented in a way close to how it will be sold. This is what David has been doing since he started with at Combrinck & Co. I now wish that I also started to work with him when I was 11. There is the curer. He enters the curing room early and only leaves for lunch and when the days work is done. He specialises in salts and making sure the meat doesn’t spoil. This is after all the point behind curing. Changing fresh pork to cured pork that families can eat it for weeks instead of having to consume it all after slaughter as is the case with lamb, beef and chicken. There is another artisan. The spice specialist. The world of aromas and flavours. He change the taste by giving the meat different tones. Subtle tastes that excite the senses. These artisans work together to produce extraordinary results. Each different step in the process being handled by a tradesman. What David Graaff and Jacobus Combrinck do with the meat in Cape Town is crude salting. Anybody can do this. What I am seeing here is Denmark is an art! The results are the same as the bacon Combrinck & Co imports from Great Britain. I am completely overwhelmed by the practical training. Besides all of this, there is the readings every night about the science behind each process. An application of the scientific method to the butchery trade. Discovering the science behind each process is like a fever that took hold of Europe.The realisation that cause and effect govern. The mechanical reasons behind everything. Since Friedrich Wöhler made urea in a laboratory in 1828, everything has changed. Let me explain to you why this was an important discovery. The owner of the butchery explained it to me yesterday. Urea is part of human urine. It is made by our bodies. For the first time, when Friedrich Wöhler made it himself, we realised that something that came from “life” could be produced in a laboratory. Synthesized. Copied exactly. (Urea, Wikipedia) Before Wöhler laboratory urea we thought that there is some kind of a vital life force creating these things. A divine energy. The entire Europe is struct by some kind of Gold Fever. Not physical gold. The gold of discovering of minerals, elements and processes. Taking what was previously only possible for nature to produce and making it in a laboratory with chemicals, compounds, liquids and gasses. Understanding the “how” and the “why” (Vitalism, Wikipedia). Everybody dream about a great discovery that will bear his or her name and bring untold riches. The peculiar reddish/ pinkish colour of cured pork. The fact that pork spoil so easily during the summer. Why smoking the meat makes it possible to send the bacon on long sea voyages to South Africa, Australia and the Americas. It is this scientific aspect that I enjoy most. I love the apprenticeship part, but in the evenings I cant wait for us to read about the science. The chemical processes. It is like figuring out a gigantic jigsaw puzzle. During the day, the slaughter house, the deboning hall, curing room, the spice room – for me, they change into laboratories where we perform experiments. I cant wait to start writing home about the things that I learn. Today was a cultural festival in Copenhagen. I missed you tremendously. It is strange that when I was at home, I wanted nothing more than to be here. Now that I am here, despite all that I learn, I would love nothing more than to be at home. Hold you tight at night and hiking our beloved mountains on the week-ends and after work. Smelling your coffee on the anthracite stove in the mornings. Taking our dogs for a hike. Helping the kids with their homework and visiting David and his brother. I miss you so much that tears come in my eyes when I see the sun setting over the sea and I think of you, my beloved! Tell the kids that I love them! I will write them next. I promise. Please send word to Oscar that you heard from me. I cant wait to be back soon! David Graaff will know that we can make good bacon when I get back. I am convinced of this. Pedersen, Jorgen Lindgaard. 2010. SCIENCE, ENGINEERING AND PEOPLE WITH A MISSION, Danish Wind Energy in Context 1891-2010. Technical University of Denmark. Simons, Phillida Brooke. 2000. Ice Cold In Africa. Fernwood Press Slingsby Map, Table Mountain XI Smith, Edwards. 1873. Foods. Henry S King and Co.
(1) Eben and Chris arrived in Copenhagen on Sunday, 9 October 2011. It was the first destination on an extensive European and UK trip to investigate bacon production methods, ingredients and equipment. (4) A quote from Ice Cold in Africa, p 12 about the Shamble: “Cape Town’s slaughterhouses took their name from the original Shambles at Smithfield Market which was situated outside London’s northwest walls. In the twelfth century, Smithfield had been the fashionable scene of jousts and tournaments but, over the centuries, it deteriorated into one of public executions and witch-burnings. By mid-nineteenth century, the district had become a filthy and stinking slum, a sink of vice inhabited by criminals. It was only in 1868, after the opening of London’s new Central Market at Deptford, that the slaughterhouses moved to more salubrious premises which consisted of 162 shops under a vaulted ceiling covering over three acres.